The Rockpack iPod Touch, iPhone, and iPad app makes a quick job of finding great video providers and creating customized video channels. The curated providers provide a quick start, and the elegant interface transforms the sometimes arduous task of tracking down great videos into one filled with pleasure. A Facebook log-in or email log-in moves you to a fantastic feed of content quickly. The feed of channels is a matrix of thumbnail images and name of provider. The top menu bar simply states your location within the Rockpack iPhone app interface and a list icon. Just below top menu bar, there is an additional menu bar to filter by category. With a touch on the category bar, a list slides from the left side of the screen. The category list is vast and includes music, gaming, comedy, sports, knowledge, food, and more. For each category, you have the chance to customize again as a list of pertinent filters expands. The customization options are highlighted in a soft, yet modern blue shade. This step visually moves you through the Rockpack iPhone app, as well as enhances the user experience. As you touch categories, you create your own customized feed. Your customized feed can be accessed by a horizontal swipe to the right, or you can touch the list icon and select it. Your customized feed is visually streamlined. Videos are grouped simply by today, yesterday, and the previous days’ names. The provider is listed at the top of a still photo from the video. You simply press the play icon to start the video. Videos start quickly–and definitely without the Facebook video lag. You can favorite and share to Facebook, Twitter, email, and text message with one touch. 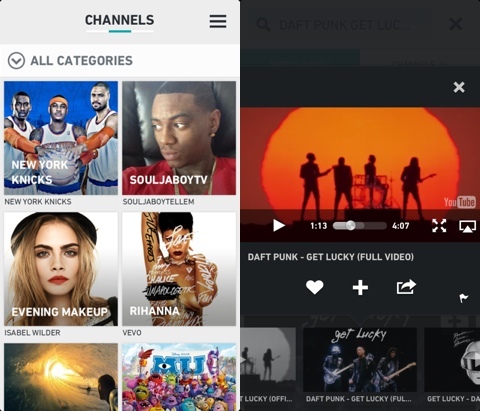 You can create your own channels simply. You touch the list icon in the top right corner, or you swipe horizontally to the left. You touch the create new channel icon. You select a cover photo, add title, and categorize it. You can add videos from your customized feed by pressing the plus icon in the upper right corner of the still photo. Or, you can add a video while playing it by touching the plus icon just below the video. The Rockpack iPhone app incorporates subtle, yet vital tools. The ability to move through the Rockpack iPhone app with gesture controls or a sliding menu adds depth and texture without muddying the interface. You can also sort your videos in your profile page by content providers with one touch. 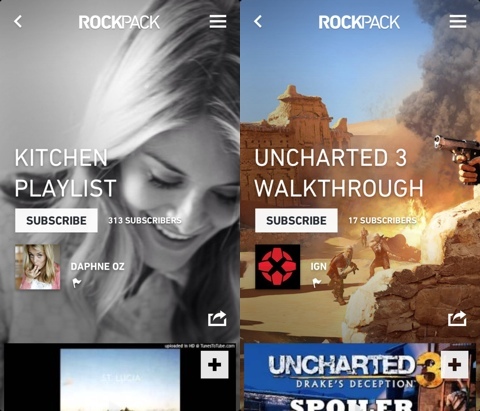 Rockpack is a great video iPhone app with solid features, streamlined interface, and superb navigation tools. The gesture controls are intuitive, and the features make creating video feeds fun. AppSafari review of Rockpack – Video & music done right was written by Jenni Ward on August 1st, 2013 and categorized under App Store, Free, Fun, iPad apps, Music, Universal, Video. Page viewed 4325 times, 1 so far today. Need help on using these apps? Please read the Help Page.